My mom totally burned me out on buckeyes as a child. Really. She made billions of them every Christmas for years and years and years and then I made myself physically ill from eating the peanut butter balls, actual spoonfuls of the melted chocolate (and paraffin? ), and finally the finished product hidden in tupperware outside in the garage. You can only imagine how thrilled she was to open those containers when it came to making last minute cookie trays and find only… crumbs. Yeeeeeah. I deserved coal and a treadmill in my stocking every year. But I haven’t wanted a buckeye in like, 15 years. Seriously. And I mean, you KNOW how I feel about peanut butter and chocolate. So good news! These aren’t buckeyes. Or maybe they are and this is just my lame attempt to pretend they are something else. However, these have a doughier (is that a word? because why is there a squiggly red line under it?) texture and obviously – tons of crisp. When I brought out Mother Lovett’s recipes a few weeks ago to gather my crap for Christmas cookies, this recipe fell out on a little faded square of paper. Not sure why I tossed it to the side in previous years, but I’m pretty sure it has something to do with the whole buckeye thing. Well that, and because it’s also on the same scrap of paper as two variations of dried beef dip. That just wasn’t doing it for me either. But these definitely do it. They are so doughy and crispy and crunchy. 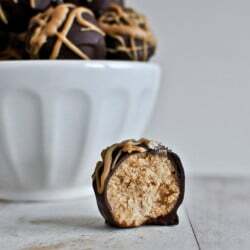 Yes, they are really just your typical peanut butter balls with lots of crisp junk shoved inside. They take other cookie dough truffles to the next level. They take buckeyes to the next level. They take your brother’s birthday to the next level. Oh yeah. I made these for him. But then we ate them all. Before we could deliver them. Story of my life. In the bowl of an electric mixer, beat peanut butter and butter until creamy and smooth. Gradually add in vanilla extract and powdered sugar with the mixture on low, speeding up once it becomes more combined. At this point you should have a cookie “dough” (depending on your brand of peanut butter you may need a little more sugar – add it 1-2 tablespoons at a time while mixing). Using a spatula, gently fold in crisped rice cereal so it gets distributed through the batter, adding more is desired. Be careful not to crush all the cereal so it stays crispy. Once combined, roll dough into balls (mine were slightly more than teaspoon-sized) and place on a parchment-covered baking sheet. Some of the balls will have crisped rice edges sticking out and some may be crumbly – that’s okay, just roll as smooth as you can occasionally squeezing the dough together if needed. Refrigerate for 60-90 minutes. Melt chocolate in either the microwave (I melt in 30 second increments while stirring) or in a double boiler. Remove peanut butter balls from fridge and dip in chocolate, then place back on parchment. Refrigerate for 30 minutes before serving. Store in the refrigerator! Note: if you want the peanut butter drizzle, I simply melted 1/2 cup of peanut butter chips then used a spoon to drizzle. You will want one. Or ten. never made buckeyes coz the thought of paraffin was too gross. LOL. you had the same idea.. These look yummy!! Going to try them today!! Happy Holidays! I just made these last night – omgosh SO good! I originally only made enough to give out to my neighbors, but it looks like I’ll be making more tonight for coworkers too! Such a huge hit, thank you! We’re going to try these out on our fondue tray for a family get together. I’ll be making them and not dipping them into the chocolate. We’ll set out just the centers to be dipped into the dark chocolate ganache we put into the fondue pot. Seems like it would be a neat variation from the cookies we usually set out. My aunt made something similar with the addition of shredded coconut to the peanut butter filling. I make a poor man’s version by eating a Reese’s Peanut Butter Cup and Almond Joy at the same time. What kind of peanut butter does this recipe call for? Is it all natural peanut butter? Or like a Skippy or Jiff?